While St. Louis is my hometown, Colleen lived there for only a few years while her husband was in seminary. We reminisced about our experiences in the city, and while many things have changed, it is still the varied and beautiful neighborhoods that make up the heart of St. Louis. There’s University City, flush with college students, hip eateries and urban flavor and design. Soulard, a neighborhood on the rise, filled with gorgeous, old buildings – a haven for artists, gardeners and young couples. Then there’s Ladue, with its old mansions and sweeping lawns and Clayton, with its mix of colleges, seminaries and parks. Different neighborhoods even feature different cuisines – Dogtown is centered around Irish pubs, while The Hill is famous for family-owned Italian eateries. Of course you can’t forget downtown St. Louis, with its famous arch and The St. Louis Cardinals as well the nearby Grants Farm which is the ancestral home of the Busch family and home to the gorgeous Clydesdale horses that represent Anheuser Busch. My ex-husband and I spent the first few years of our marriage in St. Louis and not long before we left to move to North Carolina, we had dinner at Houlihan’s (I could not remember the name of this place for the life of me until I saw my friend Kristen with the Dine and Dish blog mention it and a lightbulb went off!) with several of our friends as a going away party. I don’t recall what I had for dinner, but dessert was something that I had to recreate. Crepes ala Bananas Foster are simply delicate crepes filled with vanilla ice cream and topped with mouth-watering, warm Bananas Foster. I love this so much I woke up the next day and I meant business. First I located a cookbook with a recipe for Bananas Foster and then I bought a crepe maker (which I long ago relieved my kitchen of). I won’t deny that might have been a bit spontaneous considering we were MOVING but I felt a burning need to remember the dish, the night and the warm ambiance of great friends; maybe I thought all of that would be replicated in North Carolina with just this one special dessert. This was the perfect dish it seemed to bring together myself, Colleen and St. Louis for a post that featured, while not a dish synonymous with the city, one that was a favorite of mine and just seemed fitting for announcing Colleen’s first novel. I asked Colleen and my daughter Emily to join me in the kitchen. I loved making this fabulous dessert with the girls. They took turns swirling the batter to create light, crisp crepes and then we made the Bananas Foster topping and to their delight, fired it up, en flambé (I tried to capture it but that flame was gone in a flash!). Scoops of vanilla ice cream nestled inside the crepes and the banana topping drizzled on top with just a sprinkling of toasted pecans finished it off perfectly. The sweet warmth of the Bananas Foster paired with ice cream is just sublime and takes me right back to that night in my home town before I embarked on a new chapter in my life. While we cooked, Colleen filled me in about her book. She and my daughter have been writing partners for quite a while, and having her book published was a huge accomplishment for her. The novel tells the story of a young woman who comes to St. Louis to start her life again after she finds her husband cheating on her. She opens a boutique wedding florist business in the city and surrounds herself with flowers and new friendships. As a bonus, her new next door neighbor just happens to be a gorgeous musician who has an eye for curvy Elly. Just when she feels that she is finally moving on from her past, she discovers that an extravagant wedding contract, one that could change her financial future, is more than she bargained for. With the help of her friends, staff and the occasional well-made Italian sandwich (a woman after my own heart), Elly bravely agrees to take on the event that threatens to merge her painful history with her bright new life, and finds herself blooming in a direction she never imagined. It’s a charming tale that I know women of all ages would love so Colleen has provided me with a giveaway for one of my readers. It’s not a gift with a huge monetary value but it is a hugely meaningful one. Seeing my daughter’s friend embark on such an exciting venture brings a combination of wonder and amazement and I wish her all the best in this endeavor! I thought I still had that old cookbook but sad to say it could not be found; the good news is it was simply a re-creation straight from the source, Brennan’s in New Orleans. In 1951, Chef Paul Blange created Bananas Foster; the scrumptious dessert was named for Richard Foster who was a frequent customer of Brennan’s and a very good friend of the founder, Owen Edward Brennan. 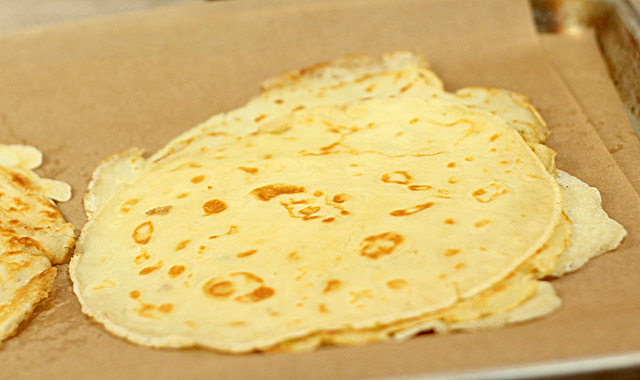 Add some dessert crepes to their recipe and voila…perfection! Combine all of the ingredients in a blender and pulse for 10 seconds. Refrigerate the batter for 1 hour. Heat a small non-stick pan and add just enough butter to coat the bottom of the pan. Pour 1 ounce of the batter into the center of the pan and swirl the pan to get the batter to spread evenly. Cook for 30 seconds and flip over. Cook for another 10 seconds and remove; lay flat on a piece of waxed paper to cool. Continue until all batter is gone. After they have cooled you can stack them and store them in re-sealable plastic bags in the refrigerator for several days or in the freezer for up to two months. When using frozen crepes, thaw on a rack before gently peeling apart. Combine the butter, sugar, and cinnamon in a flambé pan or skillet. Place the pan over low heat and cook, stirring, until the sugar dissolves. 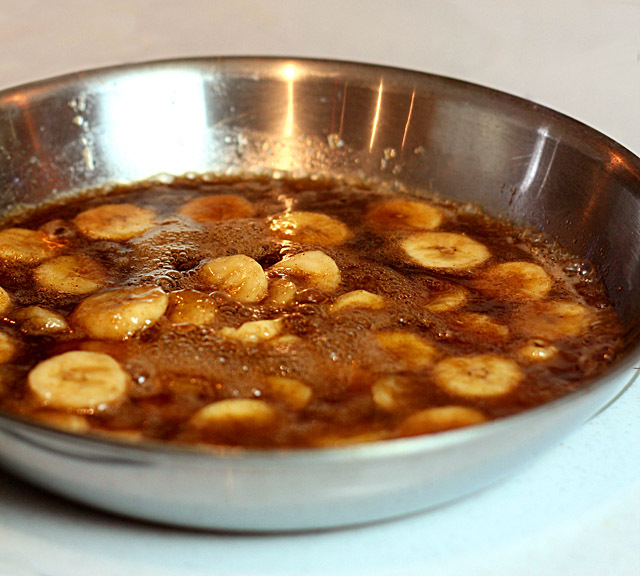 Stir in the banana liqueur, then place the bananas in the pan. When the banana sections soften and begin to brown, carefully add the rum. Continue to cook the sauce until the rum is hot, then tip the pan slightly to ignite the rum with a long match. Remove from heat. Spoon a scoop of ice cream down the center of each crepe and roll it the sides of the crepe to the middle; flip over and place the seam side down on a plate. 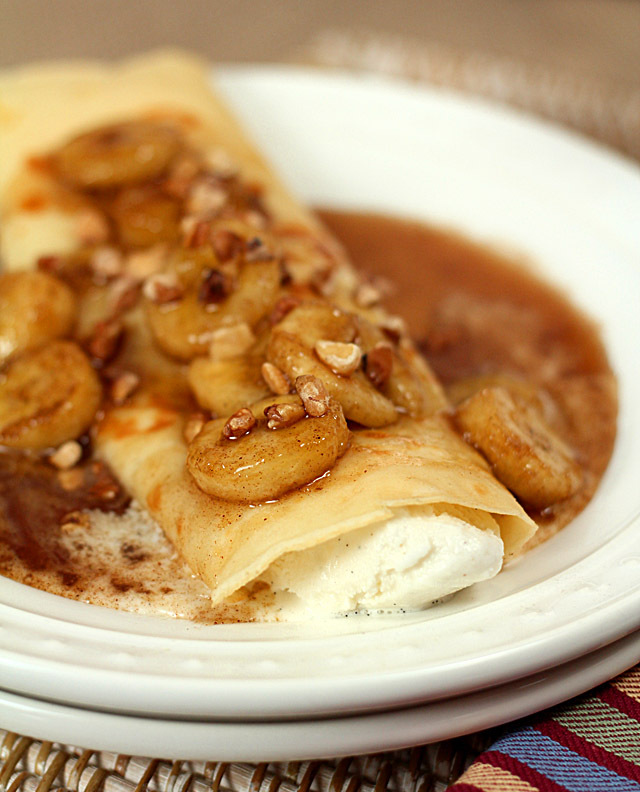 Generously spoon the bananas and warm sauce over the top of the crepe. Garnish with chopped pecans and serve. This will make enough crepes for more servings or to freeze some for future use. Just let them thaw before trying to separate them. I haven’t had Bananas Foster in years! And I’m not sure if I’ve ever made it before. I should – I make a mean crepe. Good recipe, good memories – good post! Thanks. These crepes are gorgeous! Funny thing, I actually just made crepes for the very first time this week. I used bananas in my recipe as well but yours sounds amazing! The rum, the banana liquer and oh, that ice cream. Lovely! I’m not entering to win the book as I’m in Canada but I had to comment that it does sound like a lovely story. Congratulations to Colleen on her first published book! 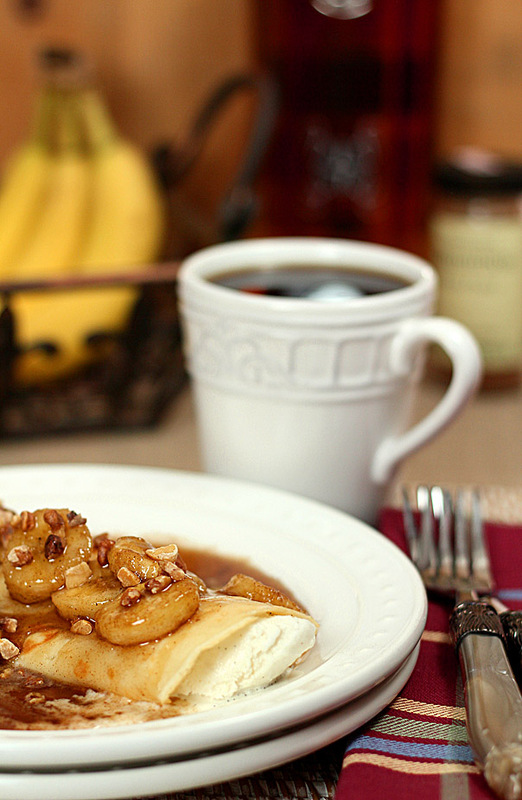 I enjoyed your story of your bananas foster crepes in St. Louis and am marveling at how beautiful you photographed the ones you made for this post. Yes please!! I love bananas foster! I love reading your posts. Not only do you have great recipes, but the stories behind them are equally intriguing. The thought of you in the kitchen with these two ladies, talking and cooking, cries “home and comfort”. It makes me smile. I think it’s fabulous that you’re giving away a copy of Collen’s book– is a great way to promote her and share her achievement! As much as I love the idea of “free”, I’m going to opt out of the giveaway. I want to support an author and her debut novel by purchasing it instead. Oh this brings me back memories of my externship at the Broadmoor in CO. They have the 2nd largest brunch in the USA (after the Bellagio being the first) and every Sunday I would be manning the bananas foster station – to order, making hundreds and hundreds. Those were the days -ha! I hope you find my long, rambling comment I just left. But I just saw that you are giving away a copy of the book! I’d love to read it! And I just posted about my husband’s Moroccan Preserved Lemon & Olive Chicken Tagine – it isn’t my dish it is my husband’s and son’s – when JP took Clem to Morocco when he was 10, he (Clem) discovered this wonderful dish and ate it at every meal he could whenever they went to a restaurant. And for years after that trip, whenever we went to a Moroccan restaurant Clem ordered that dish. Now, when JP makes it we watch Clem eat it and think of him as a curious, adventurous, excited little boy and it warms our hearts. What a beautiful post, Barb. I just posted a recipe on my blog and the story behind it that makes that recipe so special, so your post is so timely and perfect. I am fascinated by the touching memories behind the food we prepare and eat. And yours is really so lovely. And the novel sounds wonderful too, very similar to a novel I love that I need to dig up and find. Anyway, the Bananas Foster Crepes are heavenly! Heavenly! How perfect! When we eat out at a local crepe joint we often end the meal with a warm crepe with a scoop of vanilla ice cream perched on top. But the warm caramelly banana topping is a show-stopper! 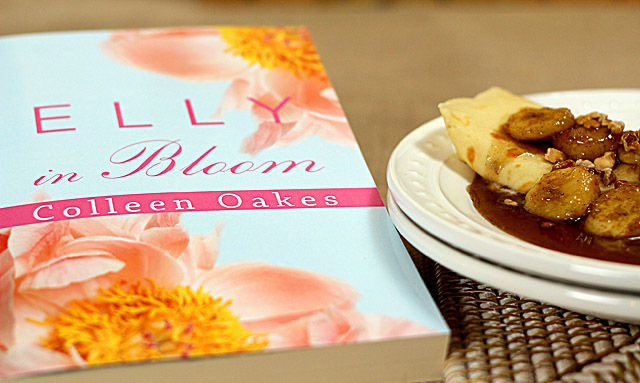 Lovely dessert and I will have to check out this book, sounds like a great read! what a brilliant idea! I’ve had bananas foster in NO and it was delicious as you’d expect it to be but the crepes? be still my beating heart! How scrumptious, I love the bananas foster topping! So funny you should post this as I made bananas Foster for my son and his friend last night. I wasn’t as adventurous as you and left out the crepes. The look just delicious. Congratulations to Colleen on her book. I wish her great success. It sounds like a very nice premise. Congratulations to Colleen for quite an accomplishment in publishing her book. I wish her nothing but success! I’ve been meaning to try my hand at crepes– a few weeks ago a friend had the girls over for a morning treat– coffee and crepes. They were delicious. Yours are gorgeous with the banana and rum topping. This is on my list of foods to make in 2013. I just adore Banana’s Foster and a crepe with vanilla ice cream topped with this delicious concoction is my idea of dessert heaven. I have travelled all over the US and what comes to mind for me is New Orleans where I had my first beignet with a delicious latte (the coffee had chicory in it). Every time I have one to this day I am transported back to the New Orleans waterfront sitting at Cafe Du Monde. One other food is a ham and butter sandwich on a fresh baguette, when I eat this I am immediately transported to Paris where I first tasted this simple but utterly delicious sandwich.